As American citizens call for disarming the public, they conveniently ignore the most deadly group of people who will be the only ones with guns—the government. A tragedy in Florida unfolded Wednesday afternoon when a psychotic former student terrorized a high school and the nation as he walked into the school and began shooting and killing students. The terrorist shooter killed 17 people. It is no surprise that the hashtag #GunReformNow is already trending on Twitter as politicians and advocacy groups alike—like every time before—begin milking this tragedy for their political agenda. Sadly, most people who call for gun control to realize what that actually means—only the government has the guns. Every time a lunatic, who is usually on some form mind-altering pharmaceutical, goes on a shooting rampage, the do-gooders in Washington, with the aid of their citizen flocks, take to the TV and the internet to call for disarming the American people. The citizens who call for themselves and their neighbors to be disarmed, likely think no deeper than the shallow speeches given by the political blowhards, designed to appeal to emotion only. They do not think of what happens during and after the government attempts to remove guns from society. They also completely ignore the fact that criminals do not obey laws and making guns illegal would have zero effect on criminals possessing guns. In the perfect statist world in which only the government has guns, we’re told that crime rates would plummet, people wouldn’t be murdered, gun violence would be brought to its knees, and a disarmed heaven on Earth would ensue. But how effective would disarming the citizens actually be at preventing gun violence, while at the same time keeping guns in the hands of government? One simple way to determine the outcome would be to compare mass shootings in America with those killed by police. It is entirely too easy to compare all senseless murders carried out by the state to those carried out by citizens, so we will zoom in with a microscope. However, just as a point of reference, in the 20th Century alone, governments were responsible for 260,000,000 deaths worldwide. That number is greater than all deaths from illicit drug use, STD’s, Homicides, and Traffic Accidents — combined. Now, on to the micro-comparison. According to a comprehensive database of all American mass shootings that have taken place since 1982, constructed by Mother Jones, there have been exactly 816 deaths attributed to mass shootings that have taken place on American soil. As Mother Jones notes, in their database, they exclude shootings stemming from more conventional crimes such as armed robbery or gang violence. Other news outlets and researchers have published larger tallies that include a wide range of gun crimes in which four or more people have been either wounded or killed. While those larger datasets of multiple-victim shootings may be useful for studying the broader problem of gun violence, our investigation provides an in-depth look at the distinct phenomenon of mass shootings—from the firearms used to mental health factors and the growing copycat problem. If we were to compare the 816 citizens killed in mass shootings to citizens killed by police in the same time frame, the comparison would be off the charts. So, for the sake of simplicity, we will compare all of the mass shooting deaths in the last 35 years, to the number of citizens killed by police since the beginning of last year. Already, in 2018, American police have killed 153 people. When we add that to 1,189 people killed by police in 2017, that number is 1,342. This number is set to increase by one, on average, every 8 hours. When comparing the total number of mass shootings over the last 35 years to just the last 14 months of police killings the ratio is 1.6 to 1, citizens killed by cops vs. citizens killed in mass shootings. That is a massive difference. The comparison is staggering and should shock the conscience. But to truly get a perspective, lets go back three years and compare all of the citizens killed by cops since the beginning of 2015 to the number of mass shooting deaths. Since 2015, cops in America have killed 3,733 citizens. In a time period that is less than one-tenth the amount of time it took mass shooters to kill 816 people, cops have killed nearly 5 times as many citizens. As the blowhards spew their nonsense about grabbing guns from law-abiding citizens and those in government demand action, all of these people conveniently ignore the giant pink elephant in the living room — cops in America are killing citizens at an alarming rate! Ironically enough, those calling for taking guns from citizens are often times the ones most critical of police killings. How, exactly, they rationalize disarming the citizens and having only police, who kill far more people than gun owners, be the sole possessors of guns, is a mystery. Red: "We need guns to protect us from the government. Also, it is unpatriotic to second-guess when armed government employees kill people." Blue: "The government has a history of racism and oppression. Guns are instruments of death. Only government employees should have guns." In the United States, the overall homicide rate is 4.9 per 100,000 among the citizens. Thanks to independent watchdog groups like KilledByPolice.net, we have a total number of citizens killed by police. As noted above, last year, police killed 1,189 citizens. Given that America has roughly 765,000 sworn police officers, that means the police-against-citizen kill rate is more than 145 per 100,000. The police kill rate is nearly 30 times that of the average citizen, yet somehow people still call for disarming citizens and say nothing about the police. 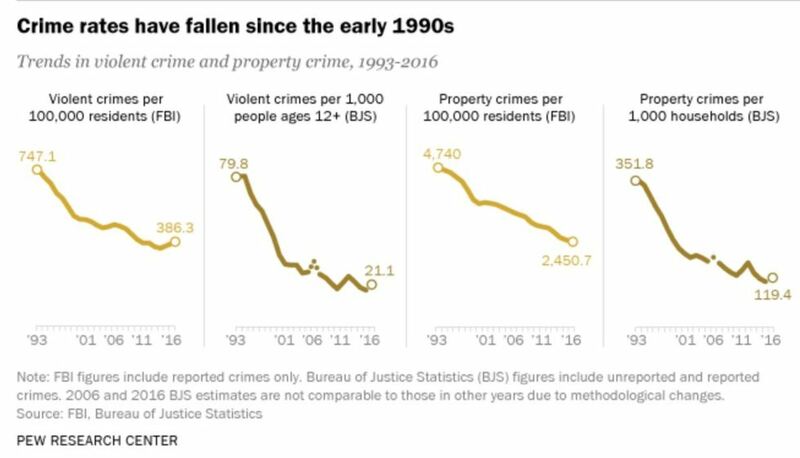 And no, the citizens are not becoming more violent. In fact, humanity is at its safest time in history—ever—and, in spite of the lunatic terrorists shooting up public places, violent crimes as well as all crime continues to drop, significantly. The next time your friends try to tell you that citizens should be disarmed, tell them what that really means; they only want government, who has a history of racism and violence, who kill indiscriminately, with zero accountability, and far more often, to be the ones with guns.